The fog of war plays a prominent role in Carl von Clausewitz’s reflections on armed struggle. In Ann Hironaka’s rethinking of war, that fog becomes all consuming, obscuring the information needed to understand and prepare for battle. Victory in war is unpredictable and tantamount to random in clashes between competitors with roughly comparable power (41). Power being hard to measure, strategists can rarely know how costly a war will be. Predictions of casualties in the 1991 Gulf War, for example, were too low by an order of magnitude (10). Strategists commonly miscalculate the best strategy in a given context, for example, seeing the offense as having the advantage on the eve of World War I while expecting the defense to dominate in World War II. With profound uncertainty encumbering military analysis, defining the national security interest of the state becomes arbitrary, Hironaka argues. Ann Hironaka. 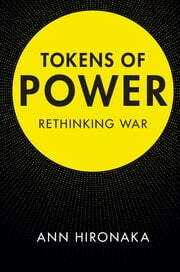 Tokens of Power: Rethinking War. Cambridge University Press, 2017. ISBN: 9781316796290. DOI: https://doi.org/10.1017/9781316796290. Like other scholars before her, Hironaka asks how strategists function in the face of this uncertainty and how this skews the outcomes of their decisions. While building on previous answers to this question, her synthesis of these insights is boldly original. Military strategists, she contends, routinely underestimate war’s unpredictability and contextual variability; they exaggerate their ability to measure power and choose a winning strategy. Their analytical overconfidence is grounded in the conventional wisdoms of the transnational military profession and its simplifying assumption that there is a reliable way to measure the pecking order of international power. Hironaka, a sociologist by disciplinary training and a social constructivist by theoretical orientation, argues that these simplifying assumptions emerge from the role of states as a reference group for social comparison in a “strong community” with “a strong status hierarchy” (265-266). This social setting creates an incentive to play the game of status competition according to community rules, since deference and rewards are based on it. The simple method of states ranking each other by their status resolves the otherwise insoluble problem of how to measure relative power and choose an optimal military strategy in the face of uncertainty. This cultural system, which political scientist Alexander Wendt might call a “culture of anarchy,” generates three “largely fictional” (51) criteria for ranking states: whether the state won its last war, how it ranks in terms of arbitrary material indicators of military power, and whether it is willing to “enact a great power identity by competing” (59). The international strategic culture of status simplifies the choice of a military strategy by encouraging states to emulate uncritically the military practice of the most recent war-winner. This culture likewise requires participation in mindless competitions of “never-ending one-upmanship,” which Hironaka likens to “jousts,” such as the pointless Scramble for Africa in the 1890s (22, 28). These cultural practices provide strategists and military planners with “a clear goal in a sea of ambiguity” (269). In developing this argument, Hironaka builds on the work of historians and especially international security scholars in political science, but she takes their insights to a dramatically original, if not entirely persuasive conclusion. Like a number of these scholarly predecessors, she asks why, since war is such a costly and incalculable gamble, anyone would ever fight a war rather than settling the dispute by bargaining. In light of the biased and perverse effects of the international culture of military status, she concludes that states should simply refuse to play this fool’s game that nobody wins. She acknowledges, however, that “to label Great Power competition as socially constructed does not mean that it is a mere figment of the imagination that can simply be wished away” (270). Change in this system might be possible, she concludes, if the tight status-based international community were to “fragment or dissolve” into a looser social order with less pressure to compare military rank, or if economic performance replaced military capability as the coin of the status realm (270-272). To assess her argument, it will be helpful to consider the rather different conclusions of the scholarly research and analysis that Hironaka draws upon. Some scholars believe states decide to fight under uncertainty because each adversary believes it can win at an acceptable cost. This may owe to private information that cannot be safely or credibly revealed (one of James Fearon’s conjectures) or to common psychological biases, such as overconfidence (one of Robert Jervis’s conjectures). Other arguments contend that war results from the objective difficulty of finding a deal that addresses each side’s vulnerability, present or prospective. Fearon and Jervis both argue that power shifts erode the reliability of commitments. Even strategists who feel certain they can trust a current bargaining partner cannot be certain that future leaders of the rival state will stick to the deal when its power grows stronger. Jervis adds a psychological dimension to this analysis, noting the widespread psychological tendency to attribute blame to the adversary’s inherent disposition rather than to the situation in which one’s own competitive behavior has placed him. This further undermines trust, making commitments to cooperate even less credible when circumstances make security scarce. Although Hironaka borrows from these international relations approaches, she diverges from their insights in several crucial respects. One feature that Fearon’s rationalism and Jervis’s mixture of rationalism and psychology have in common with each other, but not with Hironaka’s interpretation, is that they portray strategic decision makers as trying to solve real strategic problems as best they can, notwithstanding the fact that situational dilemmas and mental shortcuts may sometimes lead them into a blind alley. Another shared feature is that their theories are consistent with the possibility that uncertainty might sometimes cause peace. While private information might sometimes cause rival strategists to be simultaneously optimistic about successful aggression, at other times private information might make both sides pessimistic about victory. Although Jervis speculates that there may be more psychological biases that produce conflict than mitigate it, that may not always be the case. Both Fearon and Jervis argue that structural changes in the military sphere, such as arms control agreements that making attacking less feasible, can be institutionalized by agreement, solving the real security problems that drive dangerous competitions. Hironaka also draws on Stephen Van Evera’s approach, which is conceptually closer to hers in emphasizing social processes that spread war-causing ideas. Van Evera’s theory highlights the incentives of states and military organizations to exaggerate the attractiveness of offensive strategies that make security seem scarce. Hironaka says that such theories based on domestic political or organizational incentives to adopt military prestige strategies are “complementary” to her own, but “these domestic factors lie outside the scope of the theory of this book” (22-23). It is worth noting that, like Fearon’s and Jervis’s arguments, Van Evera’s remains rooted in a material analysis of power balances and strategic circumstances, which social incentives and misrepresentations may skew but do not simply invent. In contrast, Hironaka’s theory portrays rivalry leading to war as fundamentally a social construction. In her account, it is caused by strategists’ need for social conventions that allow cognitive simplifications, specifically their convergence on oversimplified lessons of the last war and stylized assessments of power rank. This account underplays any connection to actual strategic problems facing strategists. Hironaka strips away variation and crucial nuance from historical accounts of simplifying biases in military analysis. It is true, for example, that soldiers and strategists often focus inordinately on the lessons of the last war, but this does not necessarily lead to consensus. Continental European states tended to underrate the relevance of the firepower and trench warfare in the U.S. Civil War for their own future warfare. They agreed that lessons of extra-European wars did not count for much, but each national military tended to focus on the lessons of its own recent past and institutional politics. The Germans learned lessons from their own great victories of encirclement battles fought with reservists exploiting railroad mobility. The French stuck to lessons based on the morale of professional soldiers in frontal assaults. The same national self-absorption applies to lessons of the diplomacy of war: European states that fared well as neutrals in World Wars I and II stuck to strategies of neutrality after those wars, whereas those who suffered under neutrality joined alliances. Thus, oversimplified lessons about the last war were self-referential and led not to convergence on an international consensus but to national divergence. Hironaka leans on prior scholarly analyses that point to the military’s tendency to engage in cognitive simplification under conditions of uncertainty, but she often portrays their findings too starkly. Jervis, for example, shows how military and other decision makers take analytical shortcuts under uncertainty that bias their conclusions. But for the most part he attributes this to honest attempts to comprehend a complex reality. Likewise, detailed new historical studies of World War I, notably Stig Förster’s, demonstrate that whatever the biases of German military leaders and the complexity of the problem they faced, there was a lot that they got right, including the risk that the war would drag on, allowing the British naval blockade to strangle Germany. Similarly, my own research emphasized that the German military leadership understood well the tactical advantages of defensive firepower under modern conditions. General Alfred Schlieffen’s plan to outflank and encircle the French army by attacking through Belgium was based on the correct assumption that that machine guns and artillery would stymie frontal assaults on the narrow Franco-German border. That said, I also argued that there remained plenty of ambiguity that allowed each of Europe’s militaries to indulge in optimistic assumptions about their own organizationally preferred ways of overcoming the difficulty of attacking their opponent. While Hironaka borrows many ideas from scholars who are steeped in realism, she also emphasizes what she sees as her underlying differences with them. For realists, she says, accepting that the national interest is irresolvably ambiguous is “anathema.” She claims that realists dwell on technological change as the source of uncertainty and are “at odds” with her conclusion that “military competition is a never-ending game of one-upmanship that may undermine ‘real’ security” (19-20). In my view, these charges against realists misfire. Both Hironaka and the realists like to cite Arnold Wolfers’s largely realist book, Discord and Collaboration, but she omits mention of his famous essay in that volume on “The National Interest as an Ambiguous Symbol.” She repeatedly draws on works by eclectic realists (Barry Posen, Van Evera, and me) who emphasize the “cult of the offensive,” but she fails to mention that our argument is not about exogenous technological change at all but rather about endogenous military bias. As for the alleged failure of realists to appreciate the self-defeating character of fighting wars for security, the most basic argument of the quintessential realists Kenneth Waltz and John Mearsheimer is that the great powers are caught in a “tragedy” of security competition in anarchy that systematically endangers their security. Realists also have a better theory of prestige and status in international relations than Hironaka gives them credit for. Like Hironaka, realist Hans Morgenthau understood that states seek prestige and standing, but rather than seeing this as a dangerous fiction, Morgenthau considered it prudential practice. Morgenthau thought that prestige offered an approximate calculus of power that would allow states to bargain rather than come to blows. This view has recently been reiterated by Jonathan Renshon, who argues that status-seeking has psychological roots but also yields strategic payoffs. This leads to one final puzzle about Hironaka’s argument. If Hironaka were right that international military society tends to converge on a conventional consensus about the measurement of power, why would this not lead to peace rather than fuel war? If everyone agrees on how to measure power, and if this is conveniently codified in a conventional status ranking of states, should this not resolve the war-causing problems of private information, overconfidence, and simultaneous optimism of rivals? Admittedly, one of Hironaka’s three principles of status rivalry is the willingness to continue to test status ranking by competition. But this runs counter to her first principle of seeking simplification of military calculations. What could be simpler than agreeing to never challenge the conventional ranking? Presumably states challenge their rankings when they are dissatisfied, and it is this, rather than some arbitrary social norm, that stimulates competitive behavior. Status rules regulate rather than cause competition. Morgenthau’s point is that the system of prestige provides states with a rule of thumb for assessing power without having to test it constantly in bloody battle. It simplifies calculations and also keeps costs down. Testing power and status through games of one-upmanship is a vehicle for adjusting calculations in a way that reduces rather than increases the costs of bargaining in anarchy. Jack Snyder is the Robert and Renée Belfer Professor of International Relations in the political science department and the Saltzman Institute of War and Peace Studies at Columbia University. Alexander Wendt, Social Theory of International Politics (Cambridge: Cambridge University Press, 1999), 246-312. James D. Fearon, “Rationalist Explanations for War,” International Organization 49:3 (1995): 379-414; Robert Jervis, Perception and Misperception in International Politics (Princeton: Princeton University Press, 1976), 32-48 and 344-349 in the 2017 edition; Jervis, “Deterrence and Perception,” International Security 7:3 (Winter 1982-83): 20-22, on overconfidence due, for example, to assimilation of information to existing beliefs. Stephen Van Evera, Causes of War (Ithaca: Cornell University Press, 1999). Jack Snyder, The Ideology of the Offensive (Ithaca: Cornell Universtiy Press, 1984), 39, 166-172. Jay Luvaas, The Military Legacy of the Civil War: The European Inheritance (Chicago: University of Chicago, 1959). Dan Reiter, Crucible of Beliefs: Learning, Alliances, and World Wars (Ithaca: Cornell University Press, 1996). Stig Förster, “Dreams and Nightmares: German Military Leadership and the Images of Future Warfare, 1871-1914,” in Manfred F. Boemeke, Roger Chickering, and Förster, eds., Anticipating Total War: The German and American Experiences, 1871-1914 (Washington, D.C.: German Historical Institute, 1999), 343-376. Ideology of the Offensive, 26-30, 33, 36-37. Kenneth N. Waltz, Theory of International Politics (Reading: Addison-Wesley, 1979); John Mearsheimer, The Tragedy of Great Power Politics (New York: W.W. Norton, 2001); Arnold Wolfers, Discord and Collaboration (Baltimore: Johns Hopkins, 1962), 147-166. Jonathan Renshon in Fighting for Status: Hierarchy and Conflict in World Politics (Princeton, 2017), 9; Hans Morgenthau, Politics among Nations (New York: Knopf, 1948).